Biometric authentication is based on the unscientific and questionable assumption that there are parts of human body that do not age, wither and decay with the passage of time, says Gopal Krishna. The sixth in a seven-part series. Having read the opinion of Justice R F Nariman and Justice Y V Chandrachud, Justice J Chelameswar wrote his 44-page-long order as part of the verdict of the nine-judge Constitution Bench on Right to Privacy. He wrote, 'Telephone tapping and internet hacking by the State of personal data is another area which falls within the realm of privacy. In its order of August 11, 2015, a three-judge bench of Justices Chelameswar, S A Bobde and C Nagappan observed that 'a scheme propounded by the Government of India popularly known as 'Aadhaar Card Scheme' is under attack on various counts'. The reason for the vehement opposition to biometric (Aadhhar)-based Central Identities Data Repository project is that it is contrary to the basic structure of the Constitution, which does not provide for an unlimited government. The project is aimed at creating an unlimited government. Even after an unjust law has been passed to make it legal, it remains bad and illegitimate. The country was put under Internal Emergency under Article 352 of the Constitution, effectively bestowing on the then Prime Minister Indira Gandhi the power to rule by decree, suspending elections and civil liberties for a 21-month period during June 25, 1975-March 21, 1977. Even the imposition of Emergency was made legal and it remained so as long as it lasted. The powers given to her virtually had no limits. Human body came under assault as a result of forced sterilisation of thousands of men under the infamous family planning initiative of her son Sanjay Gandhi. 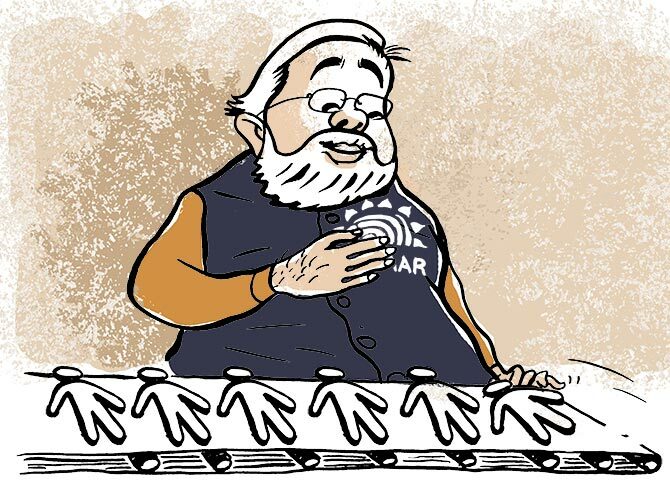 Likewise, former PM Manmohan Singh, and the incumbent, Narendra Modi, have been misled into the installation of an authoritarian architecture through biometric identification of Indian residents. Unless the Right to Privacy law is enacted before implementing any electronic and biometric identification exercise, it will be akin to letting adharma reign and evil designs have a field day. Human body is again under attack through indiscriminate biometric profiling with patronage from the prime minister. However, further improvements to Aadhaar authentication, by using iris scan as an alternative and other factors -- such as demographic, one time password-based authentication -- have not been considered in these studies. This is done using different factors like: What you know -- user id/password, PIN, mother's maiden name etc; what you have -- a card, a device such as a dongle, mobile phone etc; and, who you are -- possessing certain biometric markers such as fingerprints, iris scan, voice etc. The biometrics captured during Aadhaar enrolment are fingerprints, iris scan and face (photograph). It is noteworthy that this paper refers to biometric markers like 'fingerprint, iris, voice etc', which means that after fingerprint and iris scan, 'voice' prints are also on the radar and its reference to 'etc' includes DNA prints as well. Notably, E S L Narasimhan, governor of Andhra Pradesh and Telangana, had said, "We are spending thousands of crores on identification cards every other day and then saying that they are useless." "It happened in the case of citizenship card, PAN card, voter identity card, and now they are coming to Aadhaar card," Narasimhan had said at the inaugural session of fifth international conference on 'emerging trends in applied biology, biomedicines and bioforensics'. Narasimhan is a former head of the Intelligence Bureau. DNA analysis has become so cheap that within a few years, instead of an Aadhaar, one can have whole DNA sequence with unique marker because 'with a few thousand rupees, everybody's entire DNA sequence can be put on a card', argued Ramakrishna Ramaswamy, former vice chancellor of the University of Hyderabad, speaking at the same conference. It is noteworthy that these efforts are going in a direction wherein very soon employers are likely to ask for biometric data CD or card, instead of asking for conventional biodata for giving jobs. It is likely to lead to discrimination and exclusion. The assumption of the Centre that the benefits of biometric systems are sufficient to warrant use of biometric technology for financial transactions is misplaced. The UIDAI paper states, 'Of the three modes, fingerprint biometric happens to be the most mature biometric technology in terms of usage, extraction/matching algorithms, standardisation as well as availability of various types of fingerprint capture devices. Such absolute faith in biometric technology is based on a misplaced assumption that parts of human body do not change with age or decay with the passage of time. Basic research on whether or not unique biological characteristics of human beings are reliable under all circumstances of life is largely conspicuous by its absence in India, even elsewhere. There is a need for Parliament, the Supreme Court, state legislatures and the high courts to examine whether or not biometrics provides an established way of fixing the identity of Indians. A report 'Biometric Recognition: Challenges and Opportunities' of the National Research Council, United States, published on September 24, 2010 concluded that the current state of biometrics is ‘inherently fallible’. That is also one of the findings of a five-year study. This study was jointly commissioned by the Central Intelligence Agency, the US Department of Homeland Security and the Defence Advanced Research Projects Agency. Another study titled 'Experimental Evidence of a Template Aging Effect in Iris Biometrics', supported by the CIA, the Biometrics Task Force and the Technical Support Working Group through Army contract, has demolished the widely accepted fact that iris biometric systems are not subject to a template aging effect. The study provides evidence of a template ageing effect. A 'template ageing effect', or 'biometric ageing', is defined as the 'degradation of recognition performance over time'. The study infers, ‘We find that a template ageing effect does exist. Notwithstanding similar unforeseen consequences, the prime minister's faith in biometrics remains unshaken. Is there a biological material in the human body that constitutes biometric data immortal, ageless and permanent? Besides working conditions, humidity, temperature and lighting conditions also impact the quality of biological material used for generating biometric data. In his book Identifying Citizens: ID Cards as Surveillance, David Lyon of Queen's University, Ontario, points out the role of cartels of identity card promoters in its proliferation. In villages, they say, when you give a hammer to a blacksmith he/she will only think in terms nailing something. The only difference is that here it is the human body which is being nailed. If biometric technologies are at hand, some people under the influence of technology companies tend to see every problem as an identification problem. In her book The Pivot of Civilization, Margaret Sanger, who visited and influenced Jawaharlal Nehru, advocated coercion to prevent the 'undeniably feeble-minded' from procreating. Almost all political parties, including the Nazis, had become votaries of genetic determinism through eugenics. Opponents of eugenics like Abraham Myerso, neurologist and psychiatrist, argued that 'there are fine people springing from the most unlikely parents, and the finest parents may bring forth the wildest and most inadequate progeny’. They rightly argued that eugenics was a pseudoscience, fraught with racist agendas. Now eugenics and its genetic determinism of identity stand discredited. Advocacy for 'Right to Identity based on biometric data' is as regressive as the eugenic programmes. In an RTI reply dated December 5, 2013, UIDAI shared the contract agreement it signed on behalf of the President of India acting through Director General of UIDAI, Government of India, with the consortium consisting of M/s Ernst & Young Private Limited and M/s Netmagic Solutions Pvt Ltd wherein 'M/s Ernst & young pvt ltd' is the lead partner and consultant. The agreement has pages numbered only till 26. The rest of the pages -- which are appendices including various information -- are not numbered. The description of approach and methodology given in Appendix A: Part C dealing with the contract -- UID CIDR consultant contract agreement with Ernst & Young, a company based in the United Kingdom, one of the members of Five Eyes alliance -- interestingly begins with the talisman of Mahatma Gandhi about pondering over how the poorest can get 'control over his life and destiny' restored and will have us believe that this is its inspiration to participate in this initiative. The other members of the Five Eyes alliance are Australia, the US, New Zealand and Canada who share all intelligence among themselves. The alliance emerged out of a secret seven-page agreement struck in 1946 between the US and the UK. Canada joined in 1948, and Australia and New Zealand in 1956. Notably, the alliance and their collaborators have agreed never to spy on each other's citizens. In an earlier RTI reply dated October 25, 2013, UIDAI revealed that Ernst & Young order date was February 26, 2010, wherein the value of the contract was mentioned as Rs 7.05 crore. The contract agreement with Ernst & Young states that 'the Unique ID will be a random 12-digit number with the basis for establishing uniqueness of identity being biometrics'. It announces that 'we will provide a unique identity to over 113.9 crore people'. This is evidently a fraudulent announcement because UIDAI with whom the agreement has been signed has mandate to provide unique identity to only 60 crore residents of India and not to 113.9 crore people. There is a logical and legal compulsion for all governmental and non-governmental institutions to ensure that all further activities relating to collection/feeding/seeding of Aadhaar being undertaken currently should be suspended with immediate effect. The agreement states that it proposes to adopt political, economic, social, technology, legal and environment (PESTLE) framework to cover all key dimensions of the UID programme. This framework merits attention for it is tantamount to rewriting the political geography of the country with hitherto unknown consequences for political rights. Most startling disclosure from the contract agreement is its admission that 'biometric systems are not 100 per cent accurate'. It admits that 'uniqueness of the biometrics is still a postulate'. The contract agreement underlines it in bold letters. There appears to be an attempt at verbal gymnastics to hide the key message here. In simple words, 'non-zero probability that two finger prints or iris prints' turning out to be a match means that there is a probability that biometric data of two different individuals can be identical. With this admission which is rooted in scientific evidence, there emerges a compelling logic to abandon the exercise of creating a database of biometric data for identification of Indian residents in favour of existing 15 identity proofs on which even the Election Commission relies for polls. It has been reported, based on disclosures of Edward Snowden, that intelligence agencies in the US and the UK have hacked and planted spyware in more than 50,000 computer networks worldwide and the number was expected to reach over 85,000 by the end of 2013. By the end of 2017, the number of computer networks infected with spyware must be in millions. Do Parliament and state assemblies know as to how many citizens of the UK, the US, Canada, Australia, New Zealand, Denmark, France, the Netherlands and Norway are currently residing in India at present? How many of them are non-traceable? How many companies from Five Eyes Alliance and its allies are currently operating in India at present? Are Indian agencies and citizens aware that the Five Eyes have 'focused cooperation' on mining of computer networks with other countries like Belgium, Italy, South Korea, Turkey and others? Besides, the Five Eyes, with the addition of Denmark, France, the Netherlands and Norway, it becomes a 'Nine Eyes' alliance for conducting espionage. The disclosures by Snowden have revealed that this alliance has the capability to directly access internet companies’ data, tapping international fibre optic cables, sabotaging encryption standards and standards bodies, hacking the routers, switches and firewalls that connect the internet together. The standing committee on information technology, in its report of February 2014, has taken cognisance of these dangers but failed to make remedial recommendations. The Constitution Bench will have the opportunity to do so in supreme national interest by ascertaining the conduct of these countries and their companies who uphold the national interest of members of Five Eyes Alliance. The interests of these countries and companies do not seem to converge with India’s interests. Biometric UID/Aadhaar is based on the unscientific and questionable assumption that there are parts of human body that does not age, wither and decay with the passage of time. Those who support Aadhaar seem to display unscientific temper by implication. The government's affidavit in the Supreme Court submits that since the Aadhaar number corresponds to a unique record, therefore, tagged to a unique individual, mere introduction of Aadhaar in the beneficiary database ensures detection of a large number of duplicates. The fact is that there is no evidence about the extent of the leakage due to duplicates. UIDAI's exercise is based on assumptions. The biometrics collected for 'de-duplicating' all the residents of India is an improbable task because the December 2009 report of UIDAI's committee on biometrics revealed that in its sample of 25,000 people, some 2-5 per cent did not have biometric records. It is estimated that approximately 5 per cent of any population has unreadable fingerprints, either due to scars or aging or illegible prints. In the Indian environment, experience has shown that the failure to enrol is as high as 15 per cent due to the prevalence of a huge population dependent on manual labour, according to R S Sharma, the then director general and mission director, UIDAI. When as many as 15 per cent fail to enrol, how does 'Aadhaar in the beneficiary database ensure detection of a large number of duplicates'? Similar indefensible arguments were advanced by the Union government in the matters of coal block allocation and 2G spectrum allocations. Now it has been admitted by the government that courts can intervene if ‘the policy decision is patently arbitrary, discriminatory or mala fide’. There is sufficient evidence to infer that decisions regarding Aadhaar and related schemes are ‘patently arbitrary, discriminatory or mala fide’. They’re arbitrary because there was no feasibility study and no cost-benefit analysis that preceded their launch. Against such a backdrop, instead of continuing with imperial initiatives like Aadhaar that relies on companies based in countries who comprise the Five Eyes alliance, the Government of India, Indian citizens and political parties need to deal with the attention diversion tactics of this alliance in a deeper and non-conventional manner to undo the harm done by their cyber and non-cyber Trojan horses. Having implied that the State is a creature of humans, Justice Chelameswar uses the term ‘subjects’ on some 11 occasions in a very specific sense. He uses it to refer to ‘citizens and non-citizens who are amenable to the constitutional authority of the State’. The fact remains, citizens are sovereigns and cannot be referred to as subjects in the constitutional sense in any democratic country because citizen is the principal and the State is its agent. In fact State is the subject of citizens. The three-judge bench of Justices Chelameswar, Bobde and Nagappan had observed that if the observations made by the attorney general are to be read literally and accepted as the law of this country, ‘the Fundamental Rights guaranteed under the Constitution and more particularly right to liberty under Article 21 would be denuded of vigour and vitality’. These three judges ought to be part of the proposed five-judge Constitution Bench because a significant part of the case has been heard by them. When the fourth Constitution Bench on the Aadhaar matter gets constituted, the attorney general should be asked as to why it has not complied with the court’s direction of the three-judge bench saying, ‘The Union of India shall give wide publicity in the electronic and print media including radio and television networks that it is not mandatory for a citizen to obtain an Aadhaar card; the production of an Aadhaar card will not be a condition for obtaining any benefits otherwise due to a citizen’. This order is the law of the land and under Article 144 of the Constitution. Unless this is done at the earliest, the Supreme Court's authority will not inspire even an iota of confidence among people. The new Bench should be wary of the attorney general's 'Note in Writ Petition (Civil) 494 of 2012 Justice K S Puttaswamy (Retd) v Union of India and others and other connected cases’, dated August 25, 2015, and similar misleading submissions because he has chosen not to act in ‘aid of the Supreme Court’. The note reads, ‘The government will be open for the deadline for linking Aadhaar to various programs being extended for another three months till March 31, 2018, for those who do not have Aadhaar. ‘These extensions will be made using powers under the Aadhaar Act and/or other legislations and will apply only to the persons who do not have Aadhaar and are willing to enrol for Aadhaar. ‘They will be facilitated to enrol for Aadhaar and will be provided benefits and services through alternate means of identification until such enrolment. This submission is tantamount to contending that the attorney general’s opinion is superior to all the orders passed by the Supreme Court so far and the law enacted by Parliament. Former Prime Minister Manmohan Singh, and the incumbent, Narendra Modi, have been misled into the installation of an authoritarian architecture through biometric identification of Indian residents. Human body is again under attack through indiscriminate biometric profiling. The first and foremost thing the attorney general is required to inform the court in particular and citizens in general as to why the government has not complied with the court’s direction. A five-judge Constitution Bench headed by the Chief Justice directed unequivocally, ‘We impress upon the Union of India that it shall strictly follow all the earlier orders passed by this court commencing from September 23, 2013. The fact that this scheme is ‘purely voluntary’ has been repeated by the court in its subsequent order of September 14, 2016 after September 12, 2016, when Aadhaar Act, 2016 came into force in toto. The verdict of June 9 and the order of June 27 categorically endorsed the order of this Constitution Bench, the first Constitution Bench in the case challenging the constitutionality of CIDR of Aadhaar numbers. The A-G has feigned ignorance about the verdict of the Supreme Court dated June 9, 2017. This verdict states that ‘it is clear that there is no provision in Aadhaar Act which makes enrolment compulsory. It categorically states, ‘Thus, enrolment under Aadhaar is voluntary’ (at paragraph 90-91 (page no. 105-106) of the 157-page-long verdict). This verdict makes it quite clear that the attorney general’s reading of Section 7 is flawed. In the light of this verdict, there is a logical and legal compulsion for all governmental and non-governmental institutions to ensure that all further activities relating to collection/feeding/seeding of Aadhaar being undertaken currently should be suspended with immediate effect. In other words, henceforth no more mandatory collection of Aadhaar for feeding/seeding of collected Aadhaar data is permissible. In order to comply with the court’s order in letter and spirit all the central, state, public and private agencies who are implementing Aadhaar-related schemes and systems are under a legal obligation to issue orders in this regard. Following this verdict, it is evident that no person can be deprived of any service for want of Aadhaar in case he/she is otherwise eligible/entitled. All the authorities have to modify their forms/circulars/likes so as to not compulsorily require the Aadhaar number in order to meet the requirement of the court’s repeated orders. The A-G’s submission -- saying, ‘Those who have Aadhaar are required to seed/link their Aadhaar with SIM Card (as per Lokniti case)’ -- is an exercise in sophistry which is unbecoming of a constitutional authority like him. The order in Lokniti case -- passed by a two-judge bench in February 2017 -- is inconsequential on three counts: One, this order came prior to June 9 verdict making it clear that Aadhaar Act does not make Aadhaar mandatory; two, it is inconsistent with the five-judge Constitution Bench order; and, three, the order cites the attorney general saying Aadhaar is not mandatory for telephone connection, thus rejecting the petitioner’s prayer seeking to make it mandatory. The verdicts make it abundantly clear that the Office Memorandum dated July 31, 2017, was issued under the signature of group coordinator, Cyber Law and Unique Identification Authority of India, ministry of electronics and information technology (MeitY), ahead of the court’s ruling, as part of the government’s argument underlining that Right to Privacy is not a Fundamental Right. The verdict takes cognisance of the fact that it was only during the course of the hearing of the case that the central government brought to light an Office Memorandum by which it constituted a committee to ‘suggest a draft data protection bill’. It seems the court has been misled by the change of goal post by the government to talk about the expert committee on proposed data protection bill instead of taking the government to task for failing to get the pending Right to Privacy bill passed. The citizens who are succumbing to such presumption are doing so because they are not informed about the potential risks. The blatant use of financial rewards akin to bribes to promote citizen’s participation in biometric identification programmes sets a very harmful precedent as it violates the principle of free and informed consent. It is, in the words of Burke, a regulated freedom. It is not an ‘abstract or absolute freedom’; they seem to have erred by not making the consequential statement which emerges from it. The fourth Constitution Bench on the Aadhaar case will have the opportunity to rectify this error drawing on the citations and premises of the Right to Privacy verdict. Informed citizens and democratic legislatures can respond to the privacy invasion project based on biometric and electronic surveillance only through non-cooperation, civil disobedience and voting against parties which support the banker-biometric technology vendor nexus.